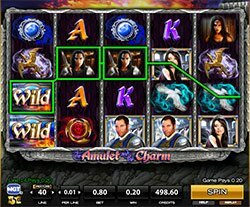 Discover a mystical and mysterious world in the 40-payline video slot The Amulet and the Charm from IGT and High 5 Games! If you need a little good fortune in your life, look no further than this engaging slot machine. You'll be taken into a world of fantasy where everyone is searching for the treasured amulet and all of the riches that come with it. Discover a mystical and mysterious world in the 40-payline video slot The Amulet and the Charm from IGT and High 5 Games! If you need a little good fortune in your life, look no further than this engaging slot machine. You’ll be taken into a world of fantasy where everyone is searching for the treasured amulet and all of the riches that come with it. The background of the slot sees a fiery sky at the top with a rocky base below the reels. It’s the perfect setting for a fantasy slot like this where you’ll also see all kind of themed symbols on the reels. Some of those symbols include a King and Queen, a male and female warrior, a dragon, a red and a blue colored amulet, a dove, and card symbols queen and king. You can also benefit from stacked wild and free spins symbols. Scatter Bucks – Scatter Bucks are activated by placing a side bet in addition to betting on paylines. With Scatter Bucks, some wild symbols will also display random credit values – anywhere from 10x to 5,000x the bet multiplier! Land these symbols and the winnings will automatically be awarded to you. Stacked Wilds – The Wild symbols is easy to spot as it says “Wild” across it. It will substitute for most other symbols in the game except the Free games scatters, to complete winning combinations when possible. Free Games – Get three Free Games symbols in any position on the reels to win yourself 7 free spins! These symbols only appear on reels 2, 3 and 4.